Northern Ireland was the best place in the whole of the UK to watch the total lunar eclipse. Star-gazers in NI were ideally placed to watch a heavenly phenomenon on Tuesday morning due to the region being the most westerly point of the UK. During the total lunar eclipse the sky turned a deep red. It is the first time in almost 500 years that a lunar eclipse has coincided with the winter solstice - the shortest day of the year - on 21 December. There is also a once-in-a-lifetime chance to see a selenelion, which occurs when the sun and the eclipsed moon can be seen at the same time. This is also known as a horizontal eclipse, because both sun and moon appear above the horizon at nearly opposite points in the sky. The full moon began to pass through Earth's shadow at about 0632 GMT on Tuesday, and the total eclipse at happened at about 0740 GMT. Observers saw a much darker moon than usual, while the sky turned a deep red colour. The eclipse should reach its maximum at 0817 GMT, and end at 0853 GMT. A lunar eclipse happens when the Moon passes through the Earth's shadow. 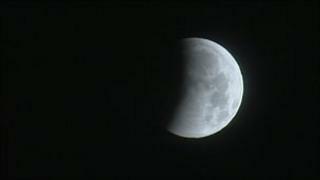 Professor Alan Fitzsimmons, astronomer at Queens university said it was "a gorgeous lunar eclipse". "The moon glided into the earth's shadow and it turned an amazing coppery red. "It is exciting because it is the first time this has happened in over 500 years ago and the next time this will happen is in another 84 years", Mr Fitzsimmons said. "It is so special due to the date and timing, as it is the longest night of the year and keen astronomers could've spent all night watching the stars and then topped it off by witnessing the eclipse. "The best part about this eclipse is you don't even need to go outside to view it." The last time a selenelion occurred, the Tudors were in power in England.